Once commercially available for use, it will travel along fixed routes at a top speed of 120 km/h (74.5 mph). 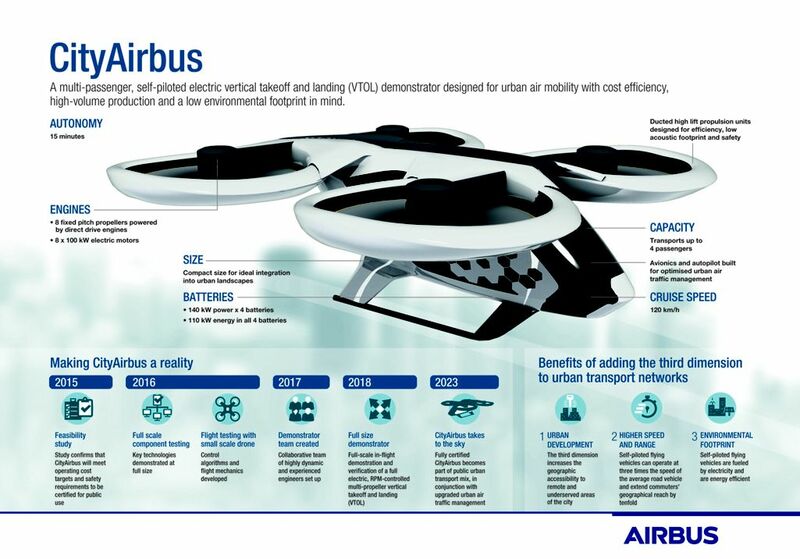 Airbus is aiming to put its flying taxi, the CityAirbus, into operation next year, as confirmed by the company earlier this week. The announcement comes after a successful full-scale ground test of the vertical take-off and landing (VTOL) vehicle’s propulsion system. “We now have a better understanding of the performance of CityAirbus’ innovative electric propulsion system, which we will continue to mature through rigorous testing while beginning the assembly of the full-scale CityAirbus flight demonstrator,” says CityAirbus chief engineer Marius Bebesel. Expect to see more flying taxis and services within the next few years as the technology is further developed and tested. German startup E-volo, for example, also has plans to launch a taxi service next year, while Uber has promised to introduce their own flying taxis by 2020. Dubai recently had a successful test of its autonomous Volocopter, which is also meant to be used in urban areas — albeit for shorter, 30-minute trips. Lastly, there’s the German company Lilium, which just received an additional $90 million to develop their all-electric flying taxi, with the intent to have a series of commercialized aircraft by 2025.